Mistakes made during childbirth can result in immense harm to a child, often requiring special care for the rest of his or her life. If your newborn was injured as a result of a medical professional's negligence, you may be entitled to compensation. Chris Olsen is an experienced birth injury attorney in San Diego, CA, helping victims of medical negligence and their families to collect the damages they need in order to cope with these devastating injuries. Contact our practice to learn more about how we can help you. Attorney Chris Olsen and his team will work to prove liability and substantiate the full extent of losses resulting from a birth injury, including costs of medical care, pain and suffering, and changes to quality of life. Although the majority of cerebral palsy cases begin in utero, some are caused by negligence during the birth process. A result of damage to the brain, cerebral palsy is a disorder of movement, muscle tone, or posture. The severity of the symptoms vary, however most patients experience impaired movement such as exaggerated or involuntary reflexes, rigidity of the limbs and core, abnormal posture, an inability to walk steadily, or a combination of these symptoms. Those with cerebral palsy may also suffer from intellectual disabilities. When there is not enough oxygen in the newborn's blood, or there is poor blood circulation, brain damage can occur. 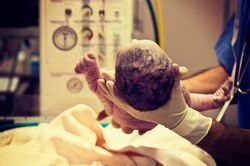 If a baby is not breathing within a few minutes of being delivered, the medical staff must act quickly. Even a few minutes of oxygen deprivation can result in lifelong brain damage, learning disorders, and seizures. Erb's Palsy is a paralysis of the arm that can occur as a result of a difficult birth. If an infant's shoulders become lodged behind the mother's pelvic bone during delivery, significant manipulation may be required. If improper action is taken by the medical team, a brachial plexus injury can occur. Located near the neck, the brachial plexus is a network of nerves that provides movement and feeling to the shoulder, arm, hand, and fingers. These nerves can be unintentionally stretched, causing injury. As a result, the baby may experience the inability to turn his head or perform fine motor activities such as writing. More severe injury may result in weakness or loss of feeling in one arm, or even partial or total paralysis of an arm. At Olsen Law Offices, we understand that dealing with a birth injury is incredibly difficult. Attorney Chris Olsen and his team will work to prove liability and substantiate the full extent of losses resulting from a birth injury, including costs of medical care, pain and suffering, and changes to quality of life. He will attempt to negotiate a fair settlement for you and your family during pre-trial. However, if the need arises, he will not hesitated to take a defendant to court. Chris Olsen has a proven track record of helping injured parties collect the compensation they deserve. Contact his office today to schedule a free consultation.